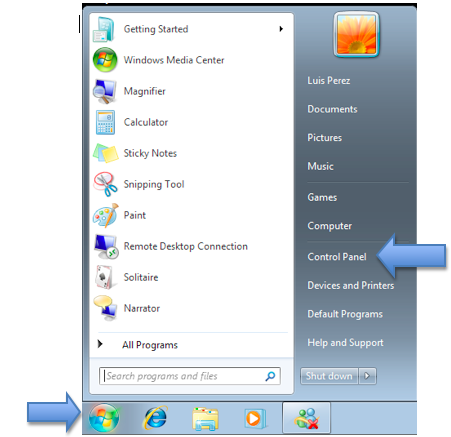 Windows 7’s Ease of Access Center provides access to all of the operating system’s accessibility settings in one location. In the Control Panel, click on the link for Ease of Access. 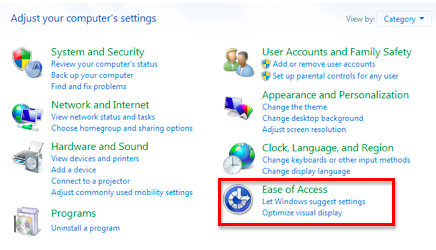 At the top of the Ease of Access Center, you will see a series of links for the different accessibility settings available in Windows 7. Optimize Visual Display: change to a high contrast display, turn on Narrator (the screen reader built into Windows 7), and use Magnifier to make text and icons easier to see. Replace sounds with visual cues: set up Windows 7 to use a screen flash each time there is a system sound. This setting is helpful to people with hearing impairments. Change how your mouse works: change the size and color of the mouse pointer, or turn on Mouse Keys to control the pointer with your keyboard. Change how your keyboard works: turn on Mouse Keys, Sticky Keys (for entering complex keyboard shortcuts one key at a time) and Filter Keys (for preventing unwanted keystrokes). Let windows suggest settings: go through a wizard that allows you to set up Windows to match your specific needs by answering a series of prompts. Start speech recognition: turn on the Speech Recognition feature, which allows you to control your computer with your voice. Set up a microphone: set up your microphone to work with the Speech Recognition feature.